Ranked No. 1 on my list, and Sports Illustrated’s top college football tradition from the August 22, 2011 issue, is Ohio State’s incomparable Script Ohio. 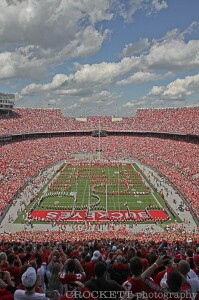 The band, known as “The Best Damn Band In the Land,” performs the formation before, or at halftime of every Ohio State football home game. This tradition began in 1936 and celebrated its 75th anniversary last season. Any written description or even Youtube video cannot do this tradition and the atmosphere around it justice, but here it goes. The band gathers in a block-type formation and starts to play the tune Le Regiment, the crowd of more than 100,000 clapping in time. They begin to unfurl, led by the drum major, in a snake-like fashion, creating the first “O”. Extreme precision is taken while forming the other three letters with band members intersecting. When the O h i o have taken formation a fourth-year or fifth-year sousaphone player slaps the hand of the marching drum major in front of him and the stadium goes crazy. The two move to the tittle spot and the sousaphone player dots the I. There have been more than 10 honorary I-dotters, including Woody Hayes, Bob Hope, John Glenn, and, my personal favorite, former heavyweight champion of the world James “Buster” Douglas. If you ever have a chance to attend an OSU football game, do it! It will be entirely worth it to see this amazing sequence of events. In 1921, Purdue’s All-American Marching Band director Spotts Emrick wanted to bring something distinctive to the band. He commissioned the building of a 10-foot tall bass drum, now known amongst the band as the Big Bass Drum. This drum measures an impressive eight-feet in diameter and is led around on a field carriage by a four man team in silver helmets. The two designated “Beaters” normally can only strike the drum but on special occasions celebrities and Purdue alumni have be permitted to hit it, including Neil Armstrong, Al Roker and Digger Phelps. Another occasion outsiders can strike the drum are the seniors before they graduate. 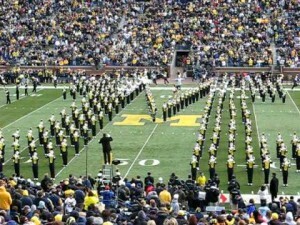 Photo courtesy of Michigan Marching Band. This tradition begins with the band lining up inside of the tunnel both teams enter the field from. The members flood onto the field high stepping out of the tunnel at a rapid rate with the fans clapping in time. The instrumentalists make eight rows, and then fill out to create the iconic block “M”. When they hit their position they begin the M fanfare. The fanfare was arranged by Jerry Bilik and contains selections of three songs; “The Victors,” “Varsity” and “The Yellow and Blue.” At the peak of the performance the drum major parades to the north end 20-yard line and performs a backbend. When I say backbend he or she removes their plumed hat and touches the crown of his or her head to the turf to the boisterous shouts of the fans. The Northwestern University Wildcat Marching Band, or NUMB, has a unique group of members referred to as The SpiriTeam. There are three members of the group that dates back to the 60s. The Spirit Leader is in charge of leading the band, students, and the Northwestern fans in a variety of cheers. A signifier for the position is a black aviator-style cloth helmet the person wears. Tradition says it originally belonged to former member who served in World War II. The Spirit Leader is appointed by a band member’s vote. Another position is The Grynder and their responsibilities include assisting the Spirit Leader during cheers and a special set of cheers this person leads. The previous Grynder appoints their successor. After the final seconds of the fourth quarter run off the clock the Badger Band casually prepares for their best tradition, the Fifth Quarter. As other collegiate bands do, Wisconsin’s band will play selections from their pre-game and half time shows. What makes this group different is they play songs such as the “Beer Barrel Polka,” “the Chicken Dance” and “Tequila.” While they play these songs the fans participate by singing and dancing along. The most bizarre part is the band is in a sort of controlled chaos. Members are not in straight formal lines one traditionally sees but some section of instruments aimlessly walk around the field playing. It started in 1969 by then-band director Michael Leckrone during a 24 game Badger losing streak. Leckrone’s ultimate goal was to encourage fans to stay for the entire game. They tradition was officially titled the Fifth Quarter in 1978. 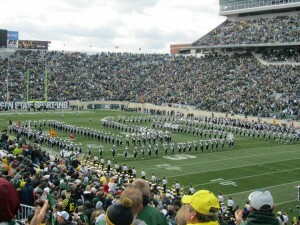 “Spinning the S” in Spartan Stadium. This tradition happens during the pregame show and is a visual masterpiece. Former assistant director William Moffit created the formation. Instrumentalists start in nine lines five-yards apart. Then they randomly start breaking off and creating different lines, occasionally turning. The first time I watched a video of this on Youtube I was very confused for 13 seconds by the movements and out of nowhere the band snaps into an “S” formation and marches simultaneously to the left on screen blaring the MSU fight song. Saturday’s in the fall before Nebraska home games the Husker Marching Band play almost 10 minutes of music to stir up excitement from the home crowd. This show is named “Pre-Game Spectacular,” is starts with band members filing out of all four tunnels in the corners of Memorial Stadium high stepping and eventually raises the pace to a run onto the field, following a drum cadence. The series of music includes “Dear Old Nebraska U,” “Mr. Touchdown USA,” “University of Nebraska March,” “March Grandioso,” “March of the Cornhusker,” and finishes with “Hail Varsity.” The ingenuity of students is great sometimes and Nebraska’s exemplifies this when the band plays “March Grandioso.” They took a classical song with no lyrics and simply sing four words over and over to the tune. The student section calls it, “The Bo Pelini Song.” The song lyrics are inspired by the current head coach Bo Pelini and his brother and assistant coach Carl. Students literally sing Bo Pelini/ Bo Pelini/ and Carl! (Carl has since moved on to coach at Florida Atlantic University so I cannot confirm if they still sing and Carl). 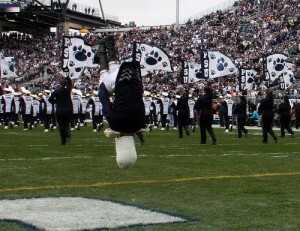 PSU Drum Major Flip. Photo courtesy of live.psu.edu. At the end of each halftime performance the Marching Illini finish with a collection of songs called the Three in One. The songs included are “Illini Pride,” “Oskee-Wow-Wow” and “Hail the Orange.” The old mascot, Chief Illiniweck, would perform a traditional American Indian dance during the songs but the mascot was retired in 2007. Illiniweck became the mascot in 1926 but the music for the Three in One even pre-dates the chief and should be heard for years to come. During the pregame festivities Penn State’s Blue Band Drum Major performs two front flips that sets the Nittany Lion fans roaring. The tradition began in 1971 by then drum major Jeff Robertson. He was not comfortable with executing the usual baton tricks other drum majors perform. So, he decided to switch things up and do a back flip. The crowds loved it and became a staple of Penn State games for the years when Robertson attended. In 1975, the following drum major, Eric Felack, did not do the flip and the fans that were so used to seeing it game after game for four years booed him. Every drum major since has done the flip and now the tradition has evolved to two front flips, one at the 50-yard line and one in the south end zone. The flips are not just for entertainment but they have become a superstitious aspect to the game. It is believed that Penn State will win the game if the two standing flips are performed. Minnesota’s Block M. Photo courtesy of gopherblog.typepad.com. Approximately two hours and 20 minutes before kickoff of a Hoosier football game on the west side stairs of Assembly Hall is an event known as “The Walk”. A relatively new tradition started in 2005 by the late former head Indiana football Terry Hoeppner. Indiana’s “The Marching Hundred” energizes the surrounding crowd waiting for the team to emerge and walk to the stadium. The band plays different songs from their repertoire during and after the team comes out of Assembly Hall. The main tradition of the Minnesota Marching Band is the forming of the “Block M” and dates back more 100 years. During the 1910 Gopher football season the band performed the first halftime show and formations. 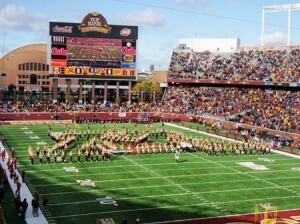 One of these shapes made by the band was a “Block M.” Today, the Minnesota Marching Band forms the outline of a capital ‘M’ in the shape of the symbol of the university at each of the band’s halftime shows. My name is Grant Gannon and I am currently a senior studying journalism at The Ohio State University. On campus, I am a sports writer and copy editor for the student newspaper, The Lantern. My future goal is to be a sports journalist covering a college football team with a website or daily newspaper. My mom went to OSU and I am the fourth of four children to attend OSU (Dad went to Miami (OH) but we do not hold that against him).